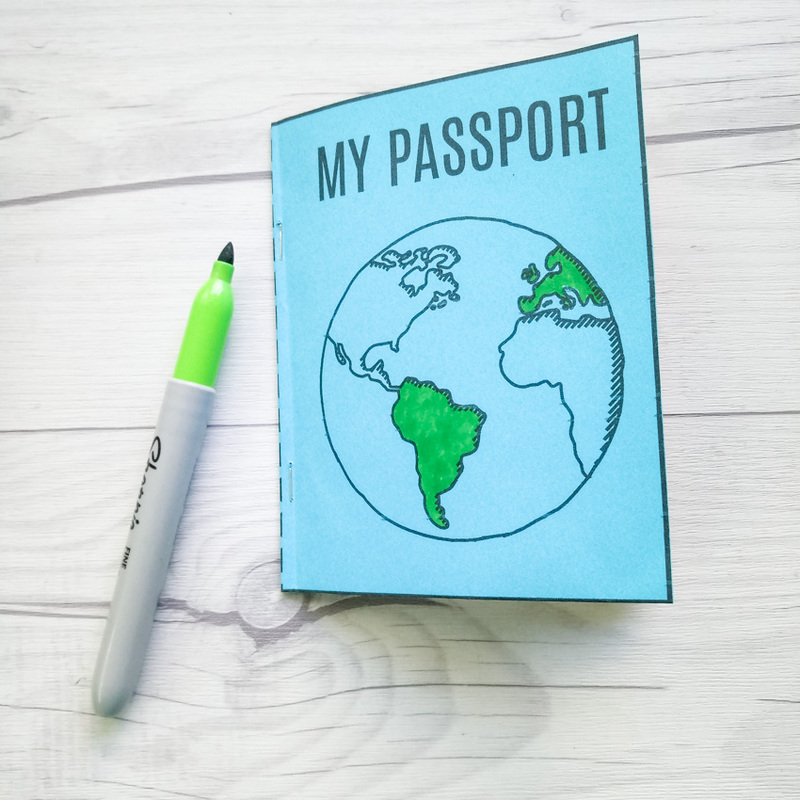 Here’s a very special Mini Passport Book, which you can print out and assemble with the kids for your learning journey when you travel! We have never travelled overseas as a family and so my daughter hasn’t had a chance to use her real passport yet. So I decided to make a pretend one for her! 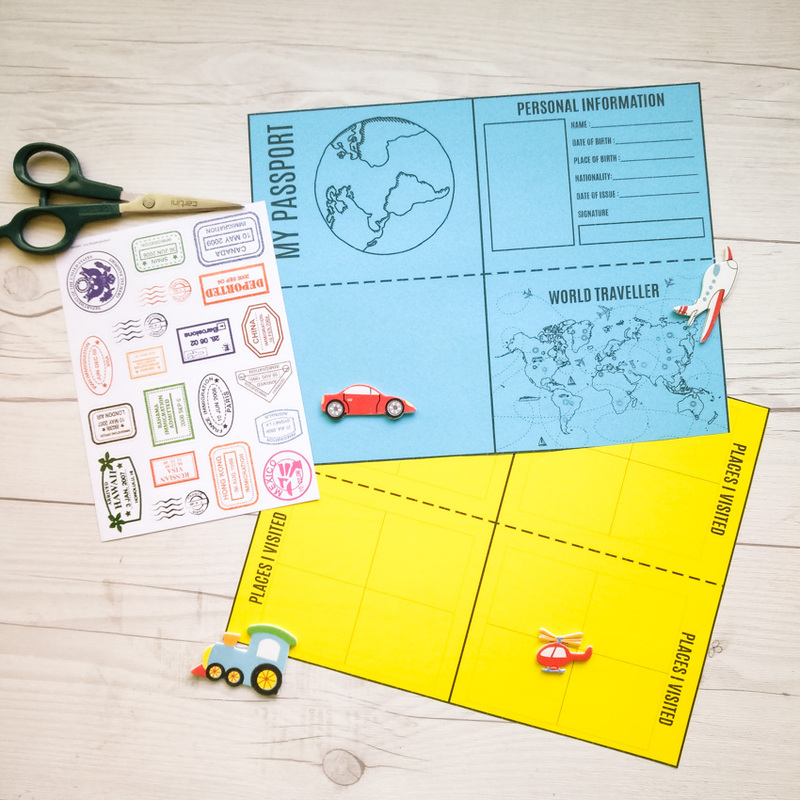 This fun pretend passport can be used by your children for local travels or even in a classroom as a learning tool. 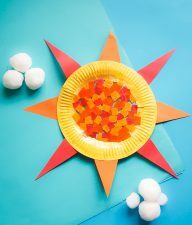 Whether you go on a road trip, by car or by plane, you might need a thing or two to keep the kids busy and this is a perfect addition to your travel kit. Collecting stamps from different countries on your passport is fun for children and adults. You can look through your passport and remember the places you have travelled. 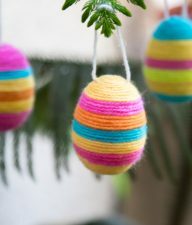 These are simple to put together, easy to use and FREE! 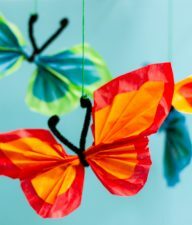 Colored Construction Paper – Letter sized for the cover & pages. We chose blue for the cover & yellow for the inside pages. 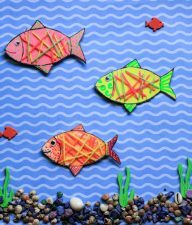 Start by printing the cover page on a Blue Letter-Sized construction paper. Cut along the outer edges. Similarly, print the inside pages on a blank white sheet or light colored sheet. You can choose to use blank pages or our template that says “Places I visited” on the top of each page. You only need to print on one side of the paper. 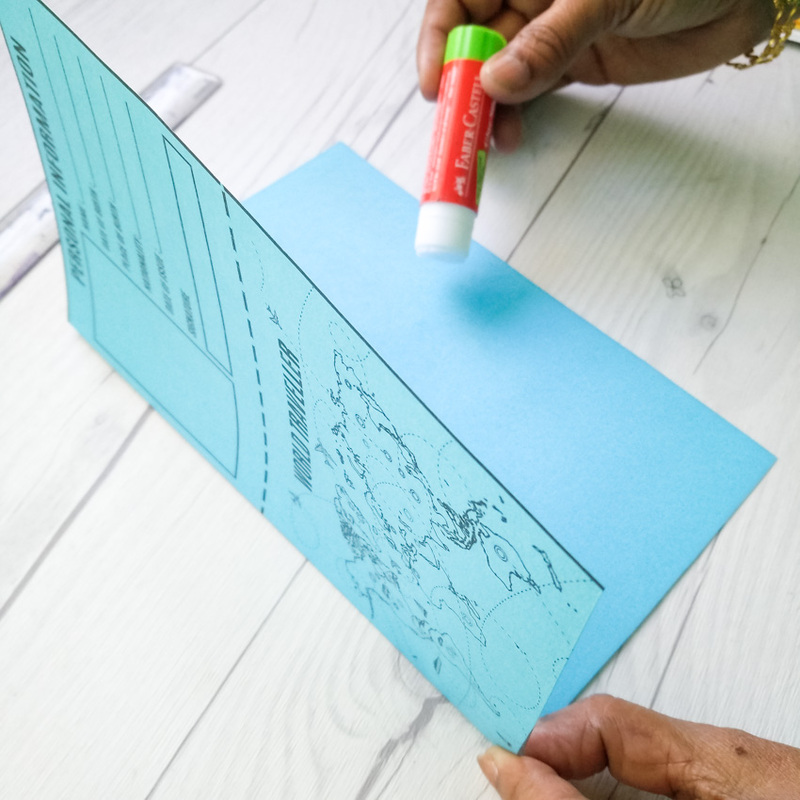 Using a ruler or a scoring blade, fold along the center of the page along the thick line. See the below image for reference. Since the cover page has to be thick to withstand the wear and tear, we used a glue stick to stick the fold together. 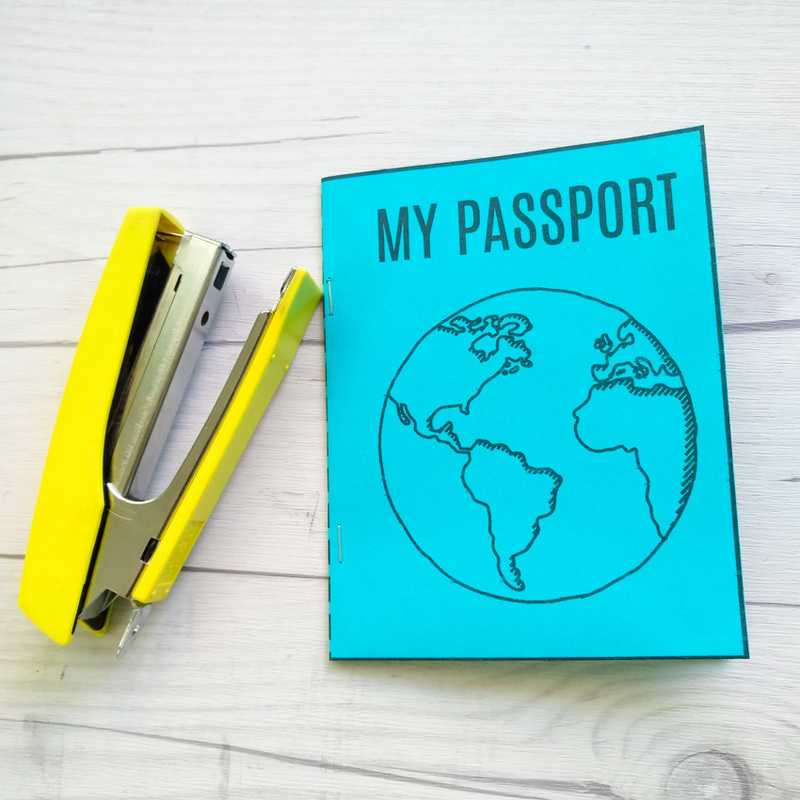 You need to stick to form a double-sided sheet to include the My passport cover and the inside personal information page (should be directly “under” the cover printing. 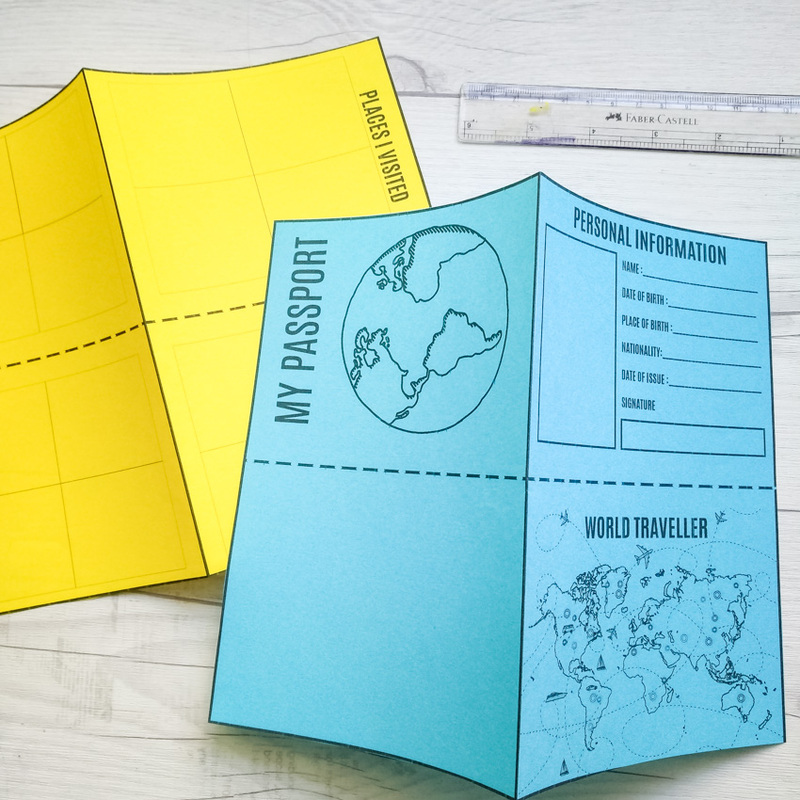 Once the cover page is printed, you simply need to fold it in half to create a passport book. For the Inside pages, we cut the paper in half and placed each printout on top of each other. 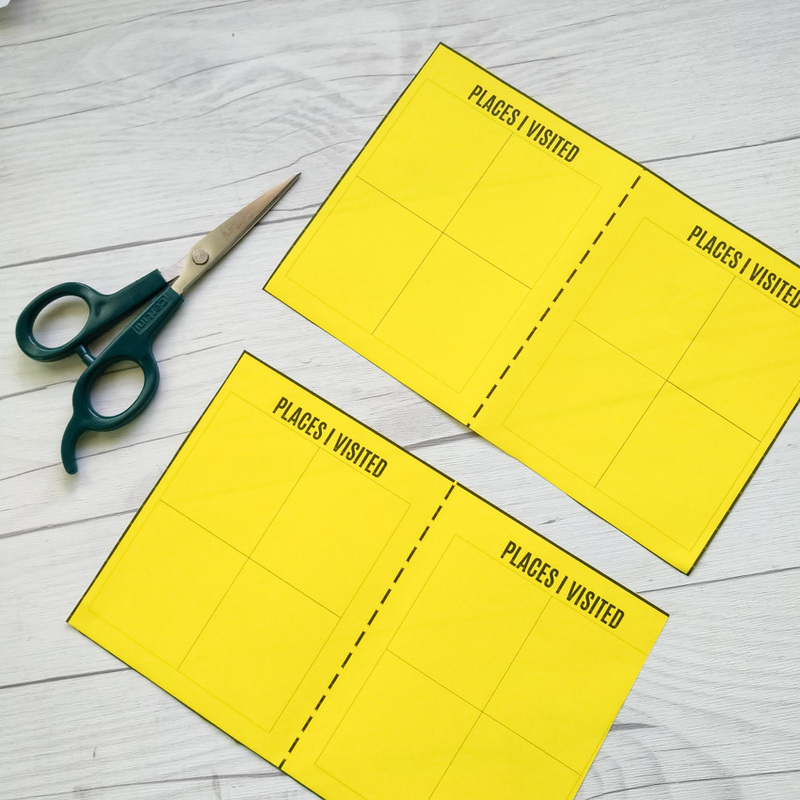 Fold all 3 sheets along the dotted line in the center and layer them like a Mini book. the cover at the bottom, the inside pages on the top. Staple in as many blank pages as you think you’ll need (one page, which amounts to 1/4 of a sheet of paper). Once the passport was ready, my daughter painted the earth green using a sharpie. The personal information page has the requisite information of DOB (date of birth) and POB (place of birth), etc that each child can fill up. A photo can be attached to the inside cover, but self-portraits or stickers work just as well. It’s time to start using the passport. 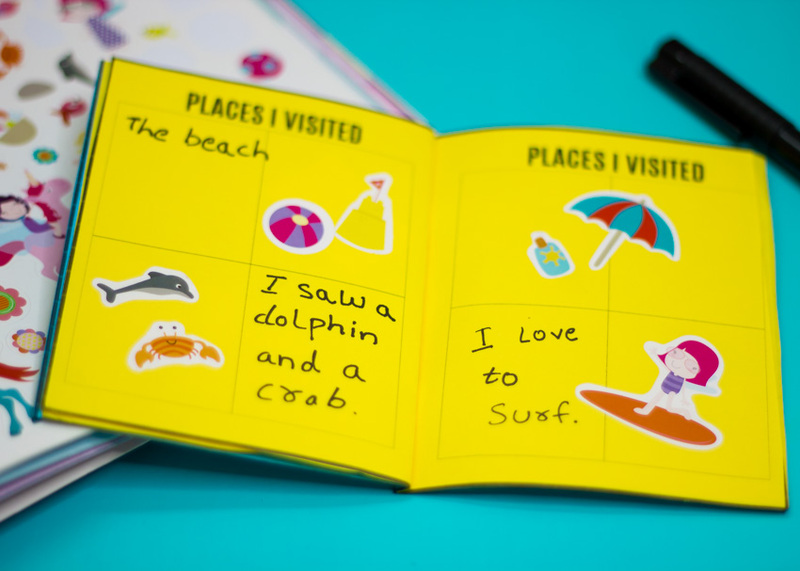 Older kids can use the inside pages to “stamp” it for each country visited (that is, each country they have studied or are exploring). 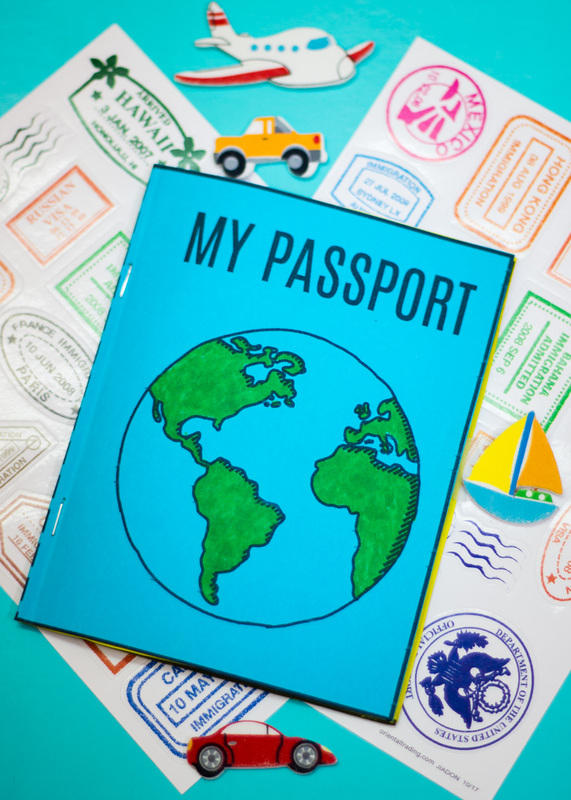 Having a passport keepsake makes learning about foreign lands even more fun for kids. 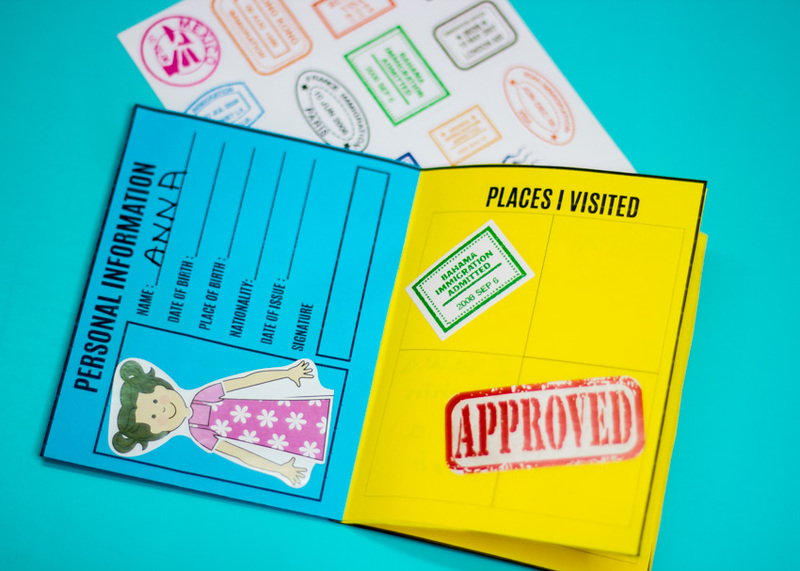 We also used fun ink pads with Passport Stamps & Sticker Sheets to decorate the inside pages. 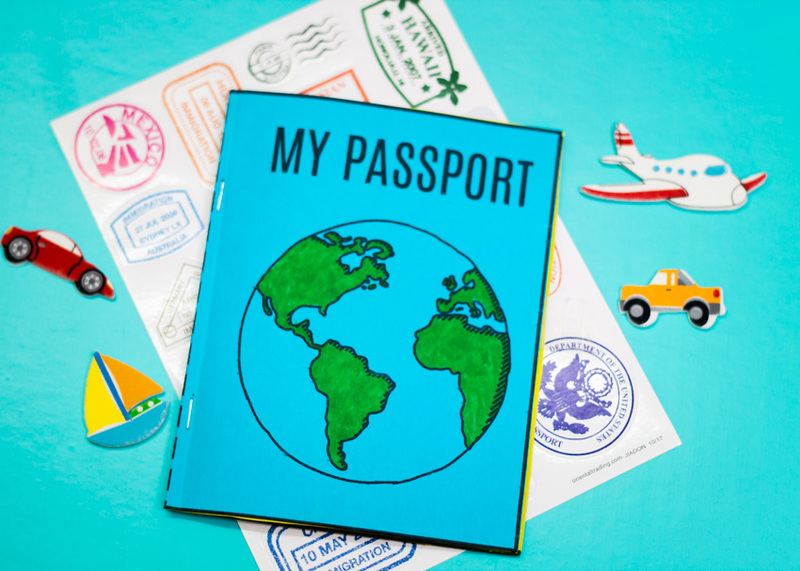 With younger kids, this passport can be used to get them thinking and writing about their vacations and recording each day with our fun printable while decorating with pictures or photos. From recording daily activities and thoughts to drawing pictures and coloring, the mini Passport Book encourages writing and creativity and are a lovely keepsake to look back on. What are you waiting for? Gather up supplies for your small traveller to use – include sticker sheets, glue, stickers, stamps and stamp pads, a small box of colored pencils and you are good to go!